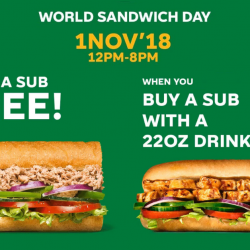 1 Nov 2018 Subway: Buy 1 Get 1 FREE 6-Inch Sub on World Sandwich Day! Get ready to double the goodness. To celebrate World Sandwich Day, you can get a free six-inch sub when you buy a six-inch sub with 22oz drink at Subway! 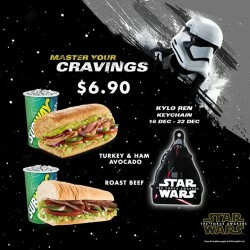 For every purchase, Subway will also donate to Singapore Heart Foundation. Only on 1st November, 12 noon to 8pm! 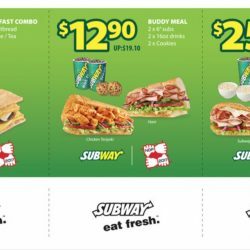 Till 14 Aug 2018 Subway: Flash These Coupons to Save on Your Breakfast, Meals, Salads & Soups! Enjoy great savings and delicious taste with Subway® coupons! Simply flash them on your mobile phone to redeem. Check out all coupons here or visit http://subwayvaluedeals.com/! 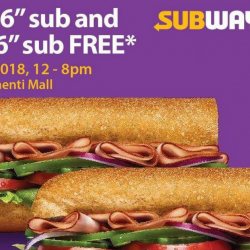 Subway: Buy 1 Get 1 FREE 6″ Sub at Clementi Mall on 23 Mar 2018! Tag a friend you’d like to go with! 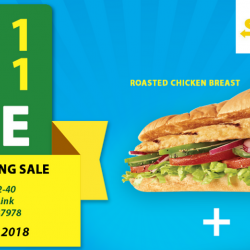 Subway: Buy 1 Get 1 FREE at NEW *SCAPE Outlet on 25 Jan 2018! This is not a drill – drop by *SCAPE tomorrow from 11am to 9pm to enjoy a buy one get one FREE sub at Subway's grand opening sale. Be there or be square!  T&Cs apply. 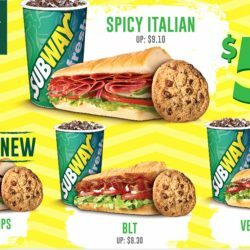 Till 10 Oct 2017 Subway: Save up to $8.90 with Coupons for Dine-in and Takeaway! Enjoy great taste and greater savings at Subway® using these coupons for dine-in and takeaway! Save up to $8.90 on breakfast, individual and buddy meals! Valid till 10 October 2017. Simply flash the coupons on your mobile phone to redeem the offer in-store! 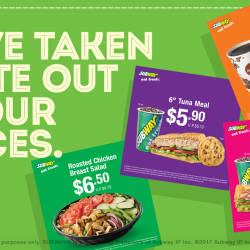 The coupons can be used at all Subway outlets! Enjoy great taste and greater savings at Subway® using these coupons for dine-in and takeaway! Save up to $10.10 on breakfast, buddy meal and bundle meal! Valid till 30 September 2017. Print them out to redeem! 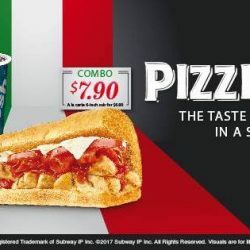 Available for a limited time only Subway: NEW Pizziola – The Taste of Pizza in a Sub! Subway's fresh take on Italian – juicy chicken + zest-errific pepperoni + marinara sauce. Get yours today for only $7.90. Available for a limited time only. 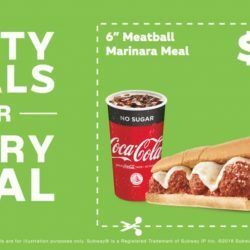 Subway's Everyday Value Meal is back! They've got 4 options, including the new BBQ Chicken Strips. Subway has brought the popular Chicken Tandoori Sub back for a limited time only! 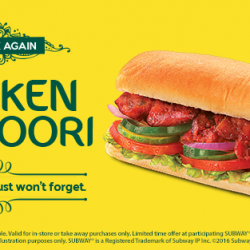 Bite into the spicy, crunchy, chunky, tender & moist Chicken Tandoori Sub starting today! Here's an offer you can't miss! 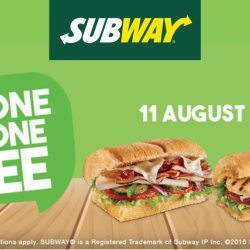 Subway is having a Buy 1 Get 1 FREE 6" Sub for one day on 11 August 2016! Bring your colleague or friend and head down to your nearest Subway tomorrow! An offer you cannot miss! 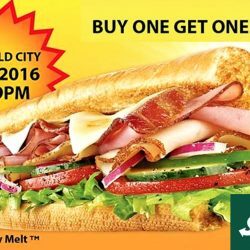 Buy 1 Get 1 Free 6" sub at Subway Great World City tomorrow from 9am till 9pm! Hurry! 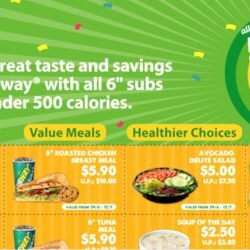 Enjoy great taste and greater savings at Subway® with all 6" subs under 500 calories using these coupons for dine-in and takeaway! Save up to $16.70 on breakfast, value meals, healthier choices and bundle meals, valid till 9 August 2016. You just need to flash them on your mobile! It’s all about spreading the love and fostering fresh friendships. Buy one sub and get the 2nd one at 50% off from now till 13 April 2016. Grab a friend and head over to the nearest Subway® outlet today! Master your cravings at $6.90 and enjoy Turkey and Ham Avocado and Roast Beef. And bring home Kylo Ren Keychain with every purchase of a Star Wars combo from tomorrow to 22 Dec. Terms and conditions apply here. Simply purchase a Roast Beef or Turkey and Ham Avocado combo at $6.90 each, and you’ll be entitled your very own Stormtooper keychain. 9 Dec 15. Terms and conditions appl. Enjoy for Subway offers Buy One Get One FREE deals. Head down to their Bukit Merah Central outlet for their Grand Opening Sale from now till 9pm Term and Conditions Apply. Save a great deal for their 5 combos at $5.50 each for 50 days. 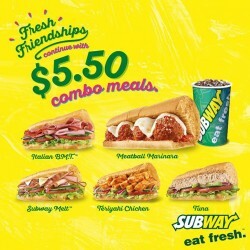 Enjoy eating only available in Subway Singapore. Term and conditions apply. Here's a deal to share with your friend or colleague! Save on the cost of one 6-inch sub sandwich on 27 August 2015! Subway is offering a Buy one get one FREE promo for one day only, dun miss it! 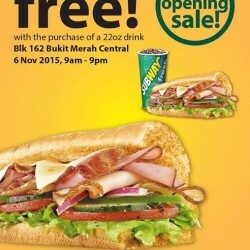 Till 31 Oct 2015 Subway: SG50 Coupon Promotions! It's time to start your healthy diet! Who says Subway is not that healthy? It depends on the type of bread, meat and sauce that you choose! Choose the subs with the healthier choice and 6 grams of fat icons to keep your calories low, e.g. Turkey, Roast Beef, The Veggie Delite, Roasted Chicken Breast, Chicken Teriyaki, Ham and Subway Club. Then choose sauces such as Honey Mustard, Mustard, Sweet Onion and Vinegar instead of the ones with higher calories like Mayonnaise and Chipotle Southwest. Save the best get all 6 stamps on your card only at Subway and get your free meal upgrade today! SUBWAY®. 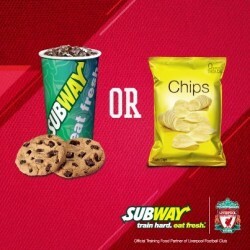 Official Training Restaurant of Liverpool FC. This SAF Day, you won’t have to sign anything to get this extra. 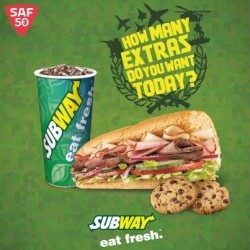 All SAF personnel can enjoy a free meal upgrade (2 cookies or a bag of chips + 22oz drink) with the purchase of any sub. 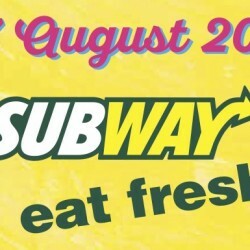 Simply head on down to any Subway® store on July 1st to enjoy this promotion! We know it isn’t fun doing the extra alone, so don’t forget to share the love with your buddies ! Hurry! 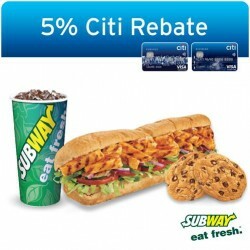 Enjoy and get Up to 5% Citi Rebate at Subway with minimum spend of S$10 on your Citibank Credit Cards.so hurry grab yours today! 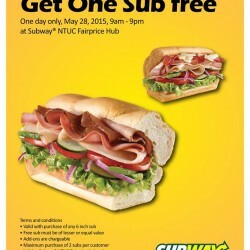 To celebrate the grand opening of Subway NTUC Fairprice Hub outlet, Subway is giving away one free Sub for every Sub purchase. To celebrate the grand opening of NTUC Fairprice Hub Subway Outlet, Subway is giving away one free Sub for every Sub purchase at the outlet from 9 AM – 9 PM, 28 May 2015– Start tagging your friends and bring them along to savour the goodness of our Subs with a deal to match!